This past week, I had my Soul Stories, SoulCollage® writing group. As usual it was filled with unexpected ephiphanies and ahahas..for the four women who participated. Here follows is a taste of what we did in the group. We began by each pulling 3-4 cards out of our deck that seemed to express where we were at in the moment or what we wanted to bring into the coming year. Next we did free writing for each card and shared. The images always speak so much more strongly than words. I shared a series of questions about what we wanted to bring into our lives for the new year, or release or focus on. The questions I focused on were: What is it I committed to receiving in 2013? Where is it I will spend my time? What abundance am I going to bring forth? and....How will I care for my body? Each of us picked questions that spoke to us personally and pulled a card for each of our questions. We did free write and the "I am the One Who" prompt, speaking from each card specifically about these issues. Once again, we all shared our writings. Towards the end of group, we picked 2 more cards from our deck, and asked them to clarify one of the issues came up in our writing. These are the 2 cards that I picked. Next we had the energy, being or essence of these cards write a letter to each other, addressing, clarifying and giving more advice to in relation to one of our questions. I am sharing my writing because it was such a powerful process for me. I am just a humble maker of things of beauty. I often wonder if my work can be infused with your spirit and speak to peoples lives, and help them on their journey. I also do so many different creative things, that I worry that I am diffusing your energy and my offerings to the world would be more powerful or of worth if I focused on just one thing. I am writing to you to get your advice on this deep issue. My creative endeavors are so many and so varied, like the creatures of the forest. My work as an art therapist and teacher, is of course prominent, but also the joy of making things and crating a life sustaining business from my art is a big piece of it all. I have tried to keep all my creative pursuits in alignment with spirit, but I am in a quandry over process vs. process. Can you offer me any advice or direction in this new year around this issue. The Maker, Embellisher and Devotee of Spirit in form. featuring the symbol is not new. 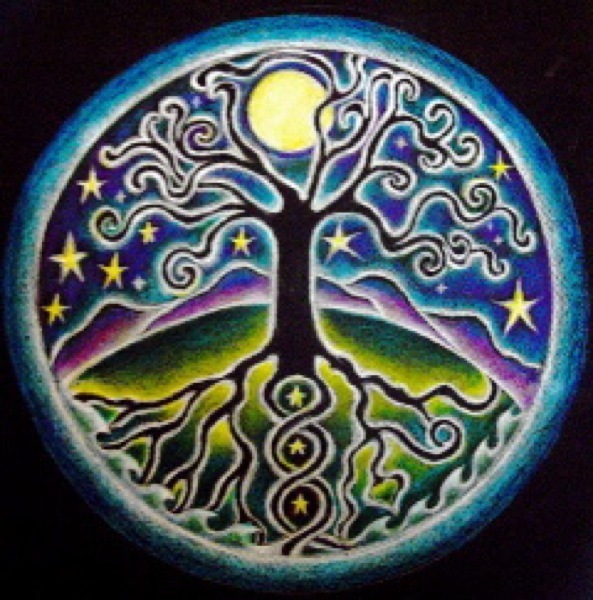 This Full Moon Winter Solstice Tree of Life is the first mandala I have drawn featuring the tree of life. It symbolizes life itself, with it's branches joining "Father Sky" in the heavens and it's roots with "Mother Earth". As a child I drew tree after tree, turning them into Tree Houses, with room in the roots, where little people lived. The branches were their porches, with little lanterns and stairways lighting the way. I drew serial tree stories, and the little people that lived in these Tree Villages. They were my childhood companions. The Full moon also seems to come up again and again in my drawings, along with the deep roots and the extending branches. When I was a young woman, living in Southern California, I felt bereft of trees. I used to go on walks to visit trees, making pilgrimages to them, since they were so rare, in the area that I lived. I think the fact there were so few trees in LA, was a factor in my moving to Northern California, where they are abundant. When I taught Creative Process classes, at Santa Rosa Junior College, I would give the exercise of drawing a Seed a Star and a Tree. Then we would put the drawings up on the wall, and brainstorm our associations with each symbol and make up stories, reflecting each drawing. The symbolic meaning of the tree of life, was so inherent to each person, and everyone loved how the drawings revealed something about their lives. it dwells in three worlds- a link between heaven, the earth, and the underworld, uniting above and below. 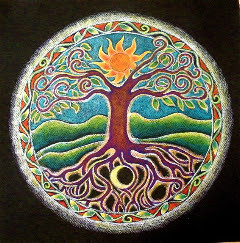 I just finished this mandala of the tree of life, and it is my most favorite. I began it at the last mandala workshop I taught. I worked on it over New Years, completing it New Years Day. I always love drawing on New Years, it is my perfect way to bring in another year. As I prepare, to teach yet another mandala workshop, I decided to share these four images here. Have a balanced and deep New Year. Sinking your roots deep into the fertile ground of your life, and extending your dreams out into the skies of your evolving imagination.